The yeast emerges from the fridge. Is it still viable? For my yeast, I selected WLP023 -- Burton Ale yeast. 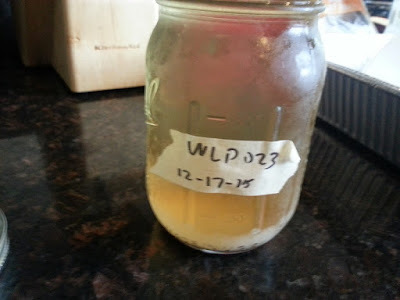 I saved a few mason jars worth of yeast from the starter I made for my last brew, the Burton Bomber in order to save on yeast cost. I started by sanitizing all my starter materials, boiling up some DME, and decanting my saved yeast (I have to admit, the beer made from the harvested starter was very tasty). This gives me an idea for a future batch! 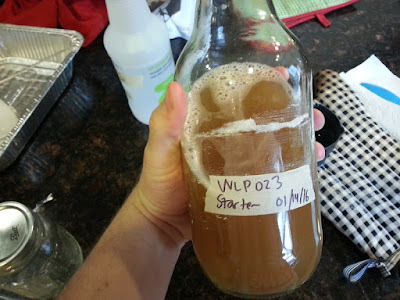 I used a 40 oz bottle for the starter this time as I did not plan to crop any of the yeast for later as I still have 3 jars in the fridge. With that set aside, I needed to wait a day before brewing. I acquired/built some new equipment to help complete this new batch. I first acquired a new 16 qt kettle to complement my brewhouse. I was not getting the full 5 gallon fill on my bucket using my existing 16 qt kettle plus the 12 quart kettle, so I needed the upgrade. Now my boils are split between the two 16 quart kettles. The 12 quart kettle will still be useful for heating up water for mashing (or if I'm trying to boil for an 8 gallon batch). Since the BIAB in a bucket method was not going to cut it for 16 lbs worth of grain, I built a mash tun out of a cooler I found in my backyard. It was time to test it out for a real brew. I acquired some hosing to attach to the barb on the outlet of my cooler. It was able to easily slip on once it was heated. This made the lautering process significantly easier. To get the mash tun ready, I assembled my CPVC manifold and heat cycled the inside of the cooler. I was told preheating the cooler made temperature control during the mash easier. I had the time of my life trying to fix a small drip from the bulkhead. Eventually I gave up trying to fix it and decided to continue mashing in. As I began to mash in, my leak out of the bulkhead ended up stopping. I guess the grain ended up plugging the hole. Or the viscosity of wort is enough to prevent that leak. I have to admit that using the bucket to slowly load in the grain made the mash much easier. The temperature stabilized at about 60°C after adding in the grain. I determined that was a good starting point for this 90 minute mash and closed the lid. The plan was to add small amounts of hotter water while stirring every 15 minutes. I'm fairly certain stirring the wort helped improve efficiency, but I'm not convinced that adding hotter water helped out the mash. I was only able to get the temperature to go up to 62 at the highest by the end of the batch. This is something I'll need to look at for next time. With the mash complete, it was time to drain the wort. I only had to vorlauf the wort a few times to get any grain bits to stop coming through; much more efficient than my older mash tun! Once the first kettle was nearly full, I added in another 4 gallons of water to batch sparge the grain. I have not constructed a sparge arm for the mash tun, so this is the method for now. It was incredibly syrupy at this point. I took extra care to balance out the runnings into both of my kettles. That should make the boil more uniform, despite having an underpowered burner. The flow came pretty fast, so I had to be careful to regulate the valve. I've still got to figure out all the idiosyncrasies of this system, but I feel confident that this can mash much larger amounts of grain. After sparging, I got about 7.5 gallons of wort ready for boiling. 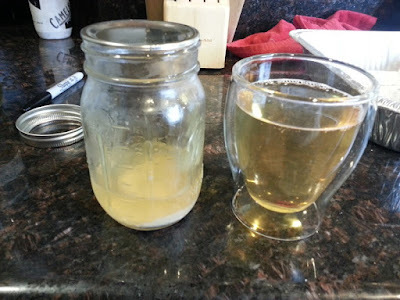 I took a reading of the first runnings (which were incredibly syrupy, even at mash temperature) and got 1.090. The later runnings were likely not as strong. Once all the wort was retrieved, it was time to boil. As I started heating, I soon learned I only had 1 hop bag for my additions. Luckily, my old steeping grains bag from my beginning days of extract brewing was a suitable substitute for my hop additions. Once the boil got going in kettle #1, I threw in my hops and started the timer. For this brew, there were three separate hop additions. Kettle #2 was boiling 10 minutes after the first one started. It wasn't too difficult to put the steeping grains bag in, I just had to ensure the stove wouldn't char the outside of it. Once kettle #1 finished boiling, I moved the second kettle over to the more powerful stove burner for that wort to experience a good 15 minutes of vigorous boiling. As kettle #2 was finishing it's boil, kettle #1 was plunged into a nice cold bath of ice water. It went pretty fast, and I was able to fill up the fermenter without requiring any additional top up water. The new kettle acquisition was successful! The wort was chilled and the starter was foaming up. It was time to pitch the yeast. Will 2 inches of headspace be enough to contain WLP023? The hydrometer read an original gravity of 1.070. This beer should finish between 7% and 8%, depending on how much of the wort remains as unfermentable sugars. I'm expecting this yeast to blowoff in a similar way the Vanilla Porter did, as the gravity on this brew is higher. All the necessary blowoff precautions were installed to ensure that any foam or beer coming out of the top will land in the jar of in the secondary containment. Only time will tell as this brew gets going.